It can be difficult to enjoy the winter wonderland that is Nova Scotia, when you are buried in snow. 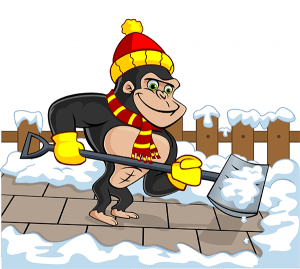 When you are ready to get back to enjoying the chilly season, without the heavy lifting, call our Gorillas for your Lunenburg snow removal and salting. Dealing with a heavy snowfall all on your own is tough, but teaming up with our Gorillas can make a world of difference. When those flakes start to fall, don’t hesitate to call in the pros for your Lunenburg snow removal and salting. There is no way to predict the weather, but that does not stop our Gorillas from trying. By following incoming weather patterns, we are always on our toes to tackle the next wave of climate issues. No one likes a surprise snow fall to slow them down, and that is why our Gorillas monitor weather patterns. By keeping an eye on incoming snow falls, warm days and frozen nights, our expert Gorillas are always ready to swing into action for our clients. Your Lunenburg snow removal and salting might seem like a simple enough task but it requires constant vigilance. Instead of being reactionary, our Gorillas are always ready in advance. Slips and falls are some of the most common causes of physical injury throughout the winter season. This is bad news for both property owners and their visitors. No one wants to ring in the new year wearing a cast and that is why our Gorillas have come up with a system that works. The night before a heavy snowfall or refreeze, our Gorillas will come to your property and begin laying salt. This preemptive strike on slippery surfaces means that your visitors and clients can stay on their feet. It is no secret that snow most commonly forms during the late night or early morning hours. Because of this, our Gorillas are available for routine snow removal as well as 24/7 emergency call out service. Our Gorillas might be quiet but we will never sneak up on you. Our Gorilla Mobiles, as well as uniforms are tricked out and colourful, so you can always pick us out of a crowd.